After showing us tons of awesome looking games, Sony straight up denied us the console. We have specs, we've seen the controller, but we haven't seen the box. 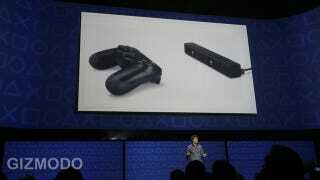 Or triangle, or orb, or whatever this non-existant hardware for the PlayStation 4 might look like. Oh and no price or release date, either. We don't even know when Sony will tell us more. Sony stoked our excitement, and there's no way to be satisfied. What a bummer. All night we heard about lofty ideas behind the development of the new console, but as the hours of demos and introductions dragged on, it became increasingly obvious that we weren't actually going to see the PlayStation 4. Not yet. All this talk about "the coming months" and "this year" is really depressing. Sony either isn't ready for primetime, or Sony thinks the best way to get us interested is to play hard to get. Oh well, more to come, means more to look forward to!